The PCE-HT200 (Shore D) hardness tester is used as a portable device for measurements at the workplace, such as testing materials in a laboratory. The hardness tester comes with a measurement component and a digital display with a resolution of only 0.2 hardness units. 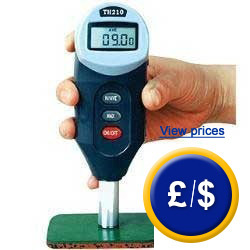 The hardness tester can be used as a handheld device in production or in stationary mode if placed in the test position. 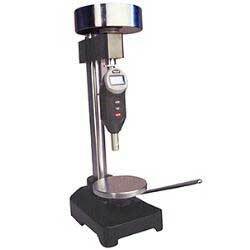 The hardness tester comes calibrated from the manufacturer and includes an ISO calibration certificate. If you return the device accompanied by the ISO calibration certificate, it will be recalibrated for an extra price. The device has an RS-232 interface which, when used in conjunction with optional software, can allow for data to be transferred to a computer. The test position of the THS 2 hardness tester is designed to test in series in order to obtain the most accurate results. Subjective measurement error caused by wrong scheme contact pressure or non-vertical measurement are excluded. The test is done on a test table and the hardness tester goes down with a constant test force - with the help of a lever. The result is shown on the hardness tester itself. The device is made of aluminium. An adjustment allows the óxamination of large and small parts. The Shore A tester comes calibrated when ordered, with an ISO calibration certificate from the manufacturer. After some time of being in use, variations in the instrument can appear and this affects the accuracy of the device. Upon your request we can perform a recalibration that meets ISO standards. This can also be ordered with the device (shipping time increasses up to 5 days).